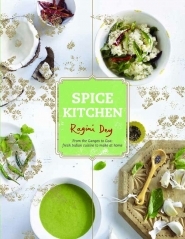 Ragini Dey runs The Spice Kitchen restaurant in South Australia which has now expanded to include cookery and spice appreciation classes. What I love about her is that she makes everything from scratch – spices mixes, pickles and chutneys and these are all covered in this wonderful book. First off the look and feel of this book is wonderful. Not smooth glossy pages but matt paper with wonderfully simple imagery. This makes it an appealing read as well as a joy to flick through. Ragini’s food memories start at her family lunch table – specifically in her grandparent’s home – with mothers, father, aunts and uncles comparing recipes and tips. This sounds just like my mother’s house on a weekend. The book starts with a section on spices which I thing is great for novices of Indian cooking. Spices are scary – even to me – and I’ve been raised with them all. Ragini explains the key spices used in the book, giving some tips for roasting and grinding as well as some good basic recipes for Garam Masala, Chaat Masala, Pastes and Phoran. Moving on the small bites which we Indians love to snack on throughout the day, I discovered some of my simple favourites such as Masala Poppadums and Pakoras but also some new ideas such as Mushroom and Coconut Shorba, a soup inspired by the arrival of the British in India, and Utthappams which I have devoured impatiently on visits to southern India but never made. India has the world’s largest vegetarian population with 60-70% of people being entirely meat free. So all the dishes she has in this next section of vegetables and pulses can be eaten on their own or as an accompaniment to the meat or fish recipes. I wasn’t too sure about the use of ‘western’vegetables such as pumpkin but her storytelling somehow converted me as I had not realised that we ate these traditionally in India. I learned about dishes I had never heard of such as Chakka, a Bengali dish and Navratan Curry which takes its name from the nine famous wise men of Akbar’s Mughal court. Fascinating. I love the historical interludes and and family stories that accompany each recipe. The next chapter was one I was interested in. Seafood. I started eating fish late in life and have never learned to cook it in an Indian way (or any other way for that matter until recently). I wanted to try so many dishes – Tandoori Fish Tikkas which I remember eating in Goa on the beach, Coconut and Coriander Baked Fish which I remember from Trivandrum beach cafes and Spicy Fish Chaat which I was not brave enough to try on the roadside in Alleppuza. 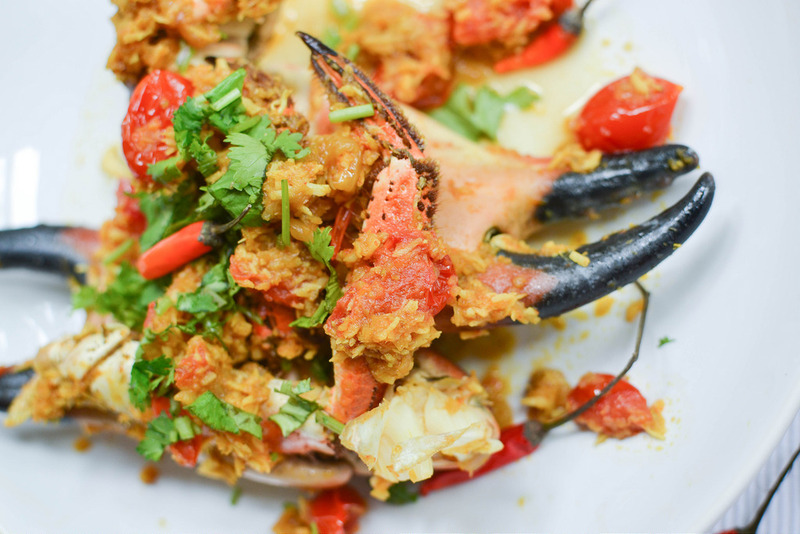 I settled on Crab Malabar because it reminded me of a visit to Mahesh Lunch Home in Juhu, Mumbai. The recipe was easy to follow and you would be envious of the aromas of onion and spices in my kitchen last weekend. I skipped the next sections on poultry and meat though I could see my husband was keen to explore. 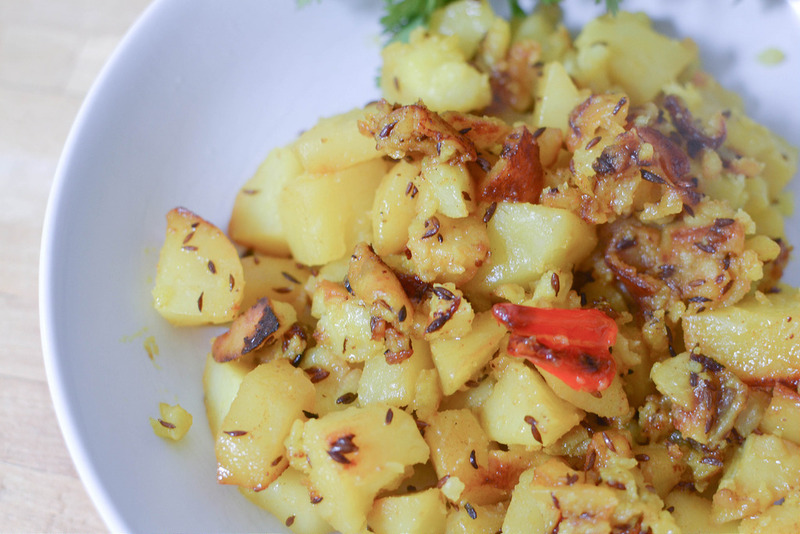 The side dishes Ragini presents are simple and innovative. I tested out a favourite of Potatoes with Cumin Seeds which I forgot about for a second and burned but I actually rather liked the crispy bits a the bottom. This section also houses Sambals, Salads and Rice variations. 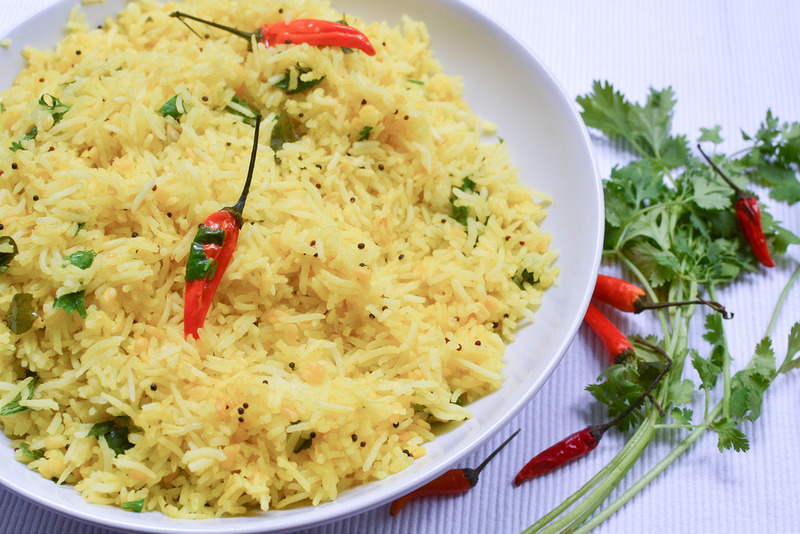 I tried the Lemon Rice because I was intrigued by the use of fried lentils as part of the tempering process. They tasted really nice adding a crunch to the rice which I will use more often with my own cooking now. It was very lemony but balanced the crab really well. Indian bread is so easy and I tend to make dough by sight and feel. This book gives good measures that work well so if you’re new to Rotis, Pooris and Bhaturas you will find them simple to make. And last but not least – desserts. Choose from Passionfruit Kulfi – a nice base recipe to experiment with using other fruit and variations of Halva which I must admit I am not a huge fan of. I liked the recipe for Bengali Malpuas which I would like to try as they seem similar to some pancakes I ate in Morocco once upon a time. I also liked that she included recipes for Phirnee which is a lesser known rice pudding and a variation of Bappadoi – a baked yoghurt pudding that I had fallen in love with at Asma Khan’s Supperclub. 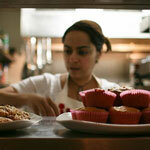 All on the list to experiment with as well as her super simple Gulab Jamun recipe. This is an easy to follow cookbook with a wide range of recipes for the seasoned home cook as well as those starting out on their spice adventures. Published by Hardie Grant who I would like to thank for my complimentary copy. Crab Malabar and lemon rice sounds wonderful, really like the sound of this book. I love cooking Indian food and have been trying to roast and grind some spices in small quantities more rather than buying them ready ground – my visit to Demuths lovely cookery school really brought home to me how much flavour you get from doing this. But reading this is inspiring me to be a bit more adventurous in the dishes I try too. It’s right up your street Kellie. Hope you win it! Like Kellie, I don’t think I’d have seen this book if you hadn’t reviewed it here. I have a very limited range of Indian-inspired dishes that I cook, so maybe it’s time to get a book and learn something more authentic!